On one of the web groups to which I belong there was some debate recently over the breeding of Forbidden, a three-year-old filly in training in the US. Placed second once and third twice from her three starts, she certainly warrants discussion, as her pedigree shows she is inbred in the first and fourth generations. Forbidden is by Holy Bull out of My McIntosh, by Pulpit out of Miss May Apples, by Clever Trick out of Sacred Sue, by Holy Bull. Put simply, Holy Bull, America's Horse of the Year in 1994, sired Forbidden out of one of his own great-granddaughters. It hardly needs saying this is a highly unusual pattern of breeding, but it was not at all difficult to effect. Sacred Sue came from Holy Bull's first crop, foaled in 1996, Miss Mary Apples was a foal of 2000, and My McIntosh a foal of 2006. Holy Bull was not exactly in his dotage, aged 18, when he had his liaison with My McIntosh. The case of Forbidden naturally provoked mentions of other horses with rare inbreeding patterns, and one whose name inevitably cropped up was Sun Gate, who ran 13 times unsuccessfully in the 1960s. She was inbred 1 x 3, sired by multiple champion sire Bull Lea out of Prince's Gate, one of his own granddaughters, and while it did not make her a runner of any consequence, she found fame as a broodmare by producing the 1984 Preakness Stakes and Super Derby winner Gate Dancer. For a more recent example of even closer inbreeding there is Winloc's Millie, foaled in 1993; she was sired by Mr Prospector out of his own daughter Our Millie. Presumably, the presence of one of the most prepotent sires of his era in both the first and second generations was meant to result in a superstar, but that didn't happen. Winloc's Millie ran four times, always unplaced, and although she achieved some success at stud, seven of her foals winning races, they scored only in very modest company. The most famous - or perhaps infamous - example of incestuous breeding in the General Stud Book involves the early influential unnamed broodmare who was described as by Spanker out of Spanker's own dam. Many have doubted the veracity of that alleged mating, which, if it was accurate, took place more than 300 years ago, if only on the grounds that breeders then, as generally ever since in the case of the thoroughbred, have tended to mate their stock in accordance with biblical guidelines. However, it has long been common enough for breeders of other species to effect incestuous matings, and what goes on in the wild among many breeds is nobody's business but their own. Circumspection doesn't come into it. An oft-cited example of an incestuous mating that went horribly wrong was that of Derby winner Orby with his half-sister, the 1,000 Guineas heroine Rhodora, in 1912. The resultant foal did not survive a ghastly entry into the world and the mare never conceived again. But there have been happier outcomes of similar unions. Foaled in 1955, the aptly named Experiment was by His Slipper out of Bedroom Slipper, the parents being half-siblings. He won minor races at Phoenix Park, the Curragh and Leopardstown, and in a relatively brief stud career he got a son rather better than himself in Sandiment, who won twice in respectable company at Saint-Cloud as a three-year-old. Somewhere in my filing system, sadly eluding recovery, is a note of a horse I saw at Doncaster many years ago, the product of a full-brother/ full-sister mating. It didn't sell and I don't suppose it ever ran, or my memory would have retained something about it. What all these facts suggest is that, over the course of the 300-plus years the thoroughbred has existed, just about every kind of mating has probably occurred and it might be a mistake to cite any as a unique example. Except, perhaps, for the case that resulted in the birth of a filly called Lover's Miss in 1933. There was no significant inbreeding involved with her, but what was remarkable was that she was by Meteoric Prince out of Countess Buckingham, who were both foals of 1931. Could there really be another instance of a foal conceived when both parents were yearlings? 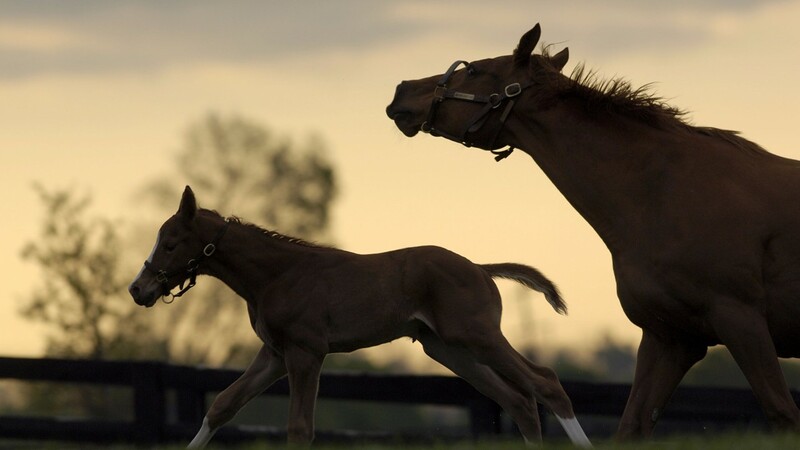 Could there really be another instance of a foal conceived when both parents were yearlings?